Mitochondrial permeability transition is a phenomenon in which the mitochondrial permeability transition pore (PTP) abruptly opens, resulting in mitochondrial membrane potential (ΔΨm) dissipation, loss of ATP production, and cell death. Several genetic candidates have been proposed to form the PTP complex, however, the core component is unknown. We identified a necessary and conserved role for spastic paraplegia 7 (SPG7) in Ca2+- and ROS-induced PTP opening using RNAi-based screening. Loss of SPG7 resulted in higher mitochondrial Ca2+ retention, similar to cyclophilin D (CypD, PPIF) knockdown with sustained ΔΨm during both Ca2+ and ROS stress. Biochemical analyses revealed that the PTP is a heterooligomeric complex composed of VDAC, SPG7, and CypD. Silencing or disruption of SPG7-CypD binding prevented Ca2+- and ROS-induced ΔΨm depolarization and cell death. This study identifies an ubiquitously expressed IMM integral protein, SPG7, as a core component of the PTP at the OMM and IMM contact site. First and foremost, the phenotypic screen does not allow a distinction between core PTP components from regulators. 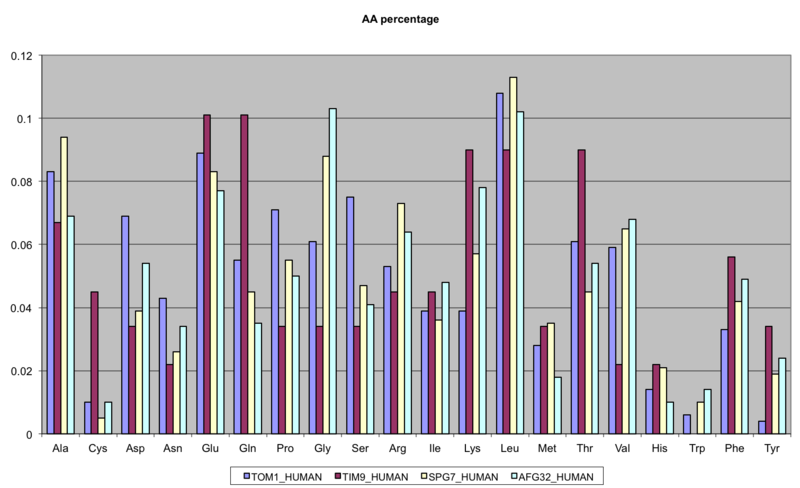 Over the past 30years the mitochondrial permeability transition - the permeabilization of the inner mitochondrial membrane due to the opening of a wide pore - has progressed from being considered a curious artifact induced in isolated mitochondria by Ca(2+) and phosphate to a key cell-death-inducing process in several major pathologies. Its relevance is by now universally acknowledged and a pharmacology targeting the phenomenon is being developed. The molecular nature of the pore remains to this day uncertain, but progress has recently been made with the identification of the FOF1 ATP synthase as the probable proteic substrate. Researchers sharing this conviction are however divided into two camps: these believing that only the ATP synthase dimers or oligomers can form the pore, presumably in the contact region between monomers, and those who consider that the ring-forming c subunits in the FO sector actually constitute the walls of the pore. 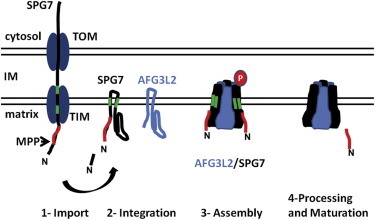 The latest development is the emergence of a new candidate: Spastic Paraplegia 7 (SPG7), a mitochondrial AAA-type membrane protease which forms a 6-stave barrel. 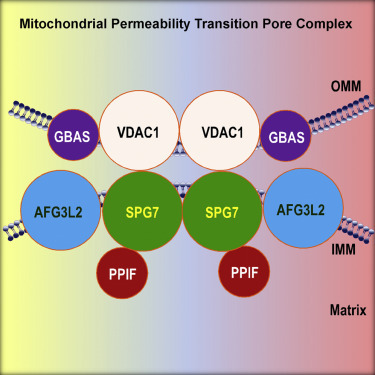 This review summarizes recent developments of research on the pathophysiological relevance and on the molecular nature of the mitochondrial permeability transition pore. This article is part of a Special Issue entitled: Mitochondrial Channels edited by Pierre Sonveaux, Pierre Maechler and Jean-Claude Martinou. The mitochondrial calcium uniporter is a Ca2+-activated Ca2+ channel complex mediating mitochondrial Ca2+ uptake, a process crucial for Ca2+ signaling, bioenergetics, and cell death. The uniporter is composed of the pore-forming MCU protein, the gatekeeping MICU1 and MICU2 subunits, and EMRE, a single-pass membrane protein that links MCU and MICU1 together. As a bridging subunit required for channel function, EMRE could paradoxically inhibit uniporter complex formation if expressed in excess. Here, we show that mitochondrial mAAA proteases AFG3L2 and SPG7 rapidly degrade unassembled EMRE using the energy of ATP hydrolysis. Once EMRE is incorporated into the complex, its turnover is inhibited >15-fold. Protease-resistant EMRE mutants produce uniporter subcomplexes that induce constitutive Ca2+ leakage into mitochondria, a condition linked to debilitating neuromuscular disorders in humans. The results highlight the dynamic nature of uniporter subunit assembly, which must be tightly regulated to ensure proper mitochondrial responses to intracellular Ca2+ signals. Mitochondrial production of reactive oxygen species (ROS) affects many processes in health and disease. SPG7 assembles with AFG3L2 into the mAAA protease at the inner membrane of mitochondria, degrades damaged proteins, and regulates the synthesis of mitochondrial ribosomes. SPG7 is cleaved and activated by AFG3L2 upon assembly. 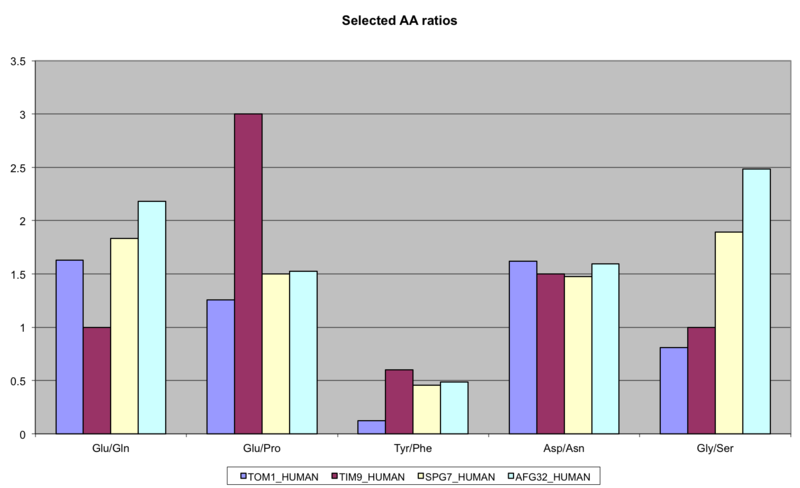 A variant in SPG7 that replaces arginine 688 with glutamine ( Q688 ) is associated with several phenotypes, including toxicity of chemotherapeutic agents, type 2 diabetes mellitus, and (as reported here) coronary artery disease. We demonstrate that SPG7 processing is regulated by tyrosine phosphorylation of AFG3L2. 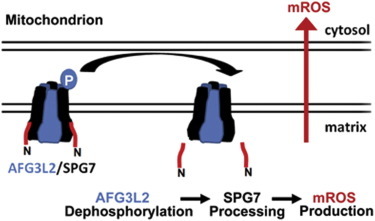 Carriers of Q688 bypass this regulation and constitutively process and activate SPG7 mAAA protease. Cells expressing Q688 produce higher ATP levels and ROS, promoting cell proliferation. Our results thus reveal an unexpected link between the phosphorylation-dependent regulation of the mitochondria mAAA protease affecting ROS production and several clinical phenotypes.